Has anyone fixed the cluster potentiometer in situ? But the gauges are in great shape. Only 76k miles, and the speedometer needle has zero bouncing or wobble. Id pull the cluster, but my experiences with w123s are that once the cluster is messed with, or the speedo cable is moved slightly, bounce then starts. So Id much rather leave it alone. Much lower risk. Impossible. Be brave. Pull the cluster and get it over with. The potentiometer can only be replaced by pulling the instrument cluster. Using a wire coat hanger form a piece of wire about 8 inches long with a formed hook on one end. Insert the hooked end of the wire to reach the inside edge of the cluster and using a pair of vice grips gently pull on the wire alternating from one end of the cluster to the other end. Be sure the wire hook is inserted as fully as possible so not to hook onto the clear plastic cover of the cluster. Once pulled out far enough reach behind the cluster and remove the speedo cable, and using a 10mm wrench disconnect the oil pressure line and pull off the main wire feed bundle on the left side of the cluster. You will now be able to pull out the cluster farther which will enable you to disconnect the few remaining wires. The potentiometer is held in place with one screw. PM me if you need a good working potentiometer for a W123 car. Caution: do not crank the engine with the cluster removed. You will have an oily mess all over the interior of your car. Thanks. I’be pulled clusters before, many times on many different w123 cars. Speedometer bounce is my hesitation here, not much else. Mine doesn’t bounce, it’s the only w123 I’ve owned that has no low speed bounce, and I want to keep it that way. I’ve noted that cable noise and bounce are related to routing, thus the hesitancy. I too have pulled several 123 clusters and have never had a problem with a bouncy speedo needle. Look under the hood and see where the cable is attached to the bell housing. Disconnect the cable at this point which will give the cable more flexibility when reconnecting to the speedometer. Reconnect the cable attaching point at the bell housing after the cluster is reinstalled. Above reduces chances of creating a slight kink in the speedometer cable casing. Anyone make a point of re lubing the cable? As most of these have probably never been re done for the last 30-40 years. I have never done a 123 speedometer cable. Does anyone know if it can just be pulled back out of the casing Lubed and reinstalled? Or is it a contained design? Anyways when the poster removes the cluster look for the need to clean the light channels. To get as much light as you can. I often wonder about the engineer that decided on the level of illumination to put into production. Possible some black forest elf from the dark ages? It is possible he just intended to extent the life of the bulbs back in the day though. If ever a running production change was needed this had to be one of them. If I recall correctly, if you do let up on the spedometer cable at the bell housing, you might be able to get away without having to disconnect it. I could have sworn I was able to get at the back of the instrument cluster without disconnecting the spedo cable enough to get a screw driver in and remove the pot housing. I could be wrong however. Non working cluster lights would drive me far more nuts than the potential risk of a bouncing cable. 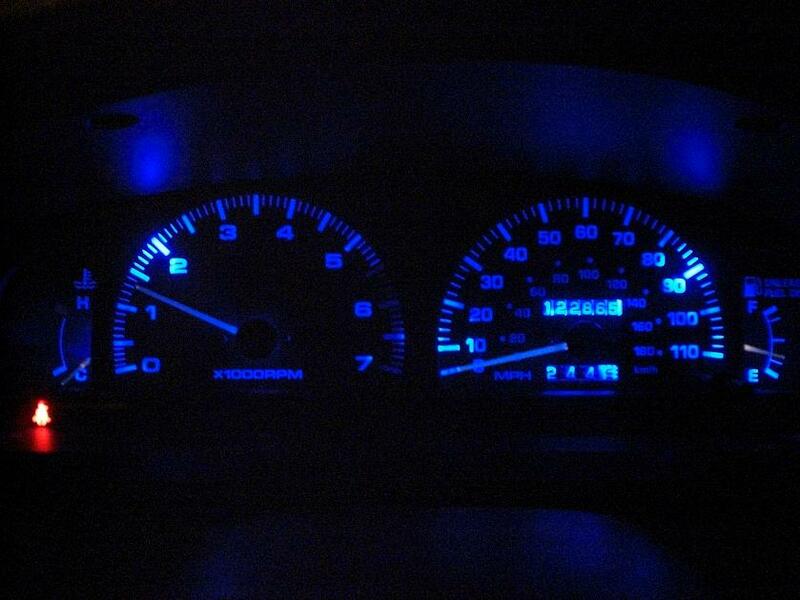 On an unrelated note, after I put a new ground wire in, the best mod I ever did was putting LEDs into my 300D's instrument cluster. The potentiometer was always jenky but I got lucky and was able to lock it at max glow which provided more than enough light to every component and the cluster. I think I fixed it with a solder reflow, but that was almost ten years ago. My 380SL on the other hand, glows so brightly with standard bulbs and has a fully working potentiometer from dim to bright. It makes no sense considering how worn everything else was on the 380sl and how in shape my 300D was compared to the electricals. Must be an east coast vs west coast thing. Are LEDs actually cooler in this application, and does it look normal, or some riced out blueish white? Like something you would find in a "tricked out" Honda, Toyota, etc. If I remember correctly, the speedo cable cannot be removed from the housing. I'd consider a bouncing spedo needle at low speeds working, but I'm just yanking your chain now. The LEDs looked pretty normal to me. The white wasn't blue at all like car headlights but was white like a flourescent light white. There's a thread here on this forum where the mini mod is mentioned. Should have some before and after pictures. Edit and here you go! I thought it was Chad who took the pic. Classic names in that thread. What a time to be a w123 owner! And now that I think about it, I ultimately never did fix that rheostat. I wonder if the guy I sold my car to still has it. Last edited by okyoureabeast; 04-18-2019 at 01:46 AM. I remember that. Ive been on here for a long time, since the mercedesshop days (2002ish). There are some older diys about cleaning the prisms and doing all kinds of great stuff if one looks way back. You can’t sleays trust color balance in pics. Thanks for the link and info! There’s not much to get. I asked a simple question and got a simple answer about replacing the potentiometer in place.